TNO organizes approximately once every 18 months the TNO Robot Competition in Delft, The Netherlands. Fully autonomous robots have to compete in five different missions. The competition is open for all organizations and institutes in the Netherlands: universities, companies, etc. In 2003 Pavbot participated in the TNO Robot Competition for the first time and finished 13th in a field of 19 robots. In 2005 Pavbot participated for the second time and finished 8th in a field of 12 robots. Each year there are five different missions, of which mission 1 is mandatory. Participating teams should sign up for at least 3 different missions, including mission 1. Mission fields are 6 meters long and 4 meters wide. The enclosure is 20 centimeters high and made of unpainted underlayment. The size of the robot is expected to be within 60 x 60 centimeters. Nothing in or on the missions fields may be damaged or moved when the robots compete. The maximum time in which a robot has to complete the different missions is three minutes. Mission 1 goal: The robot has to ride through the opening in the enclosure. 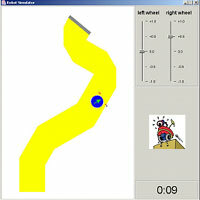 The course is known beforehand and obstacles (60 x 40 x 10 centimeters) are placed on the course. The opening in the enclosure is opposite the starting point of the robot. Mission 2 goal: The robot has to ride through the opening in the enclosure. The course is, in this case, not known beforehand and obstacles (60 x 40 x 10 centimeters) are placed on the course. The opening in the enclosure is opposite the starting point of the robot. Mission 3 goal: The robot makes contact with the football. There are no obstacles on the unknown course. The floor is grass and the color of the football is yellow. Mission 4 goal: The robot moves the ball out of the enclosure. There are no obstacles on the known course. The floor is grass and the color of the football is yellow. Mission 5 goal: The robot touches the obstacle at the end of the plateau. The plateau is 10 centimeters high and 85 centimeters wide. The course is not known. The obstacle at the end of the plateau is 20 centimeters high and as wide as the plateau itself. The floor is made of unpainted underlayment. To be able to work in parallel with the hardware team, the software team decidec to build a simulation environment to test different software strategies.